This week Koen and I decided to bake our own bread for a change. Koen has excellent baking skills which I attribute as a heritage from his parents who also are excellent cooks. Therefore, I guess it is in the genes. Me in the other hand … I have three distinct experiences that made me rethink my ability to bake. My first baking attempt was baking butter cookies which according to some are the easiest cookies to make. I disagree … My cookies were so hard that almost cost my whole family dental treatments. But I did not give up there; a while after I decided to bake a cake imaging that would be easier. Oh boy I was wrong…. The cake experience would have been fine if I hadn’t forgotten one essential ingredient: SUGAR. Do you believe it?! I forgot to add sugar to my cake… and once more my guinea pigs (my family) suffered the consequences. Anyhow… after that I spend a while without adventuring myself in the baking world, which by the way made my family really thankful. But a few months later I moved to Wales and there I was expected to make bread … Yeah… bread. Imagine me baking bread?! I freak it out! But I once more adventured myself in trying to bake. Poor People who decided to put me in charge of that. What I can say about that is that during the whole year I lived there I baked bread once. Anyhow… after that I was convinced that baking was not my cup of tea. Then years later, I think when the traumatizing experiences were fading a bit away in my memories I decided that was time to try again. It was then that I came across to a Brazilian recipe that reminded of my childhood in Brazil. It was something my grandmother used to bake. And guess what? BREAD. Yes… I once more decided to bake bread. Well at this point everyone must be thinking that I was crazy for trying it again after all what happened in the past and that for sure it would be another unsuccessful story. But as one would say “who lives from the past is museum!” and with this though in mind and with my boyfriends support I went for it!! And guess what?! It did work!!!! Yeah I guess you could figure that out by now otherwise why would I be writing all of this in a cooking blog, right?! 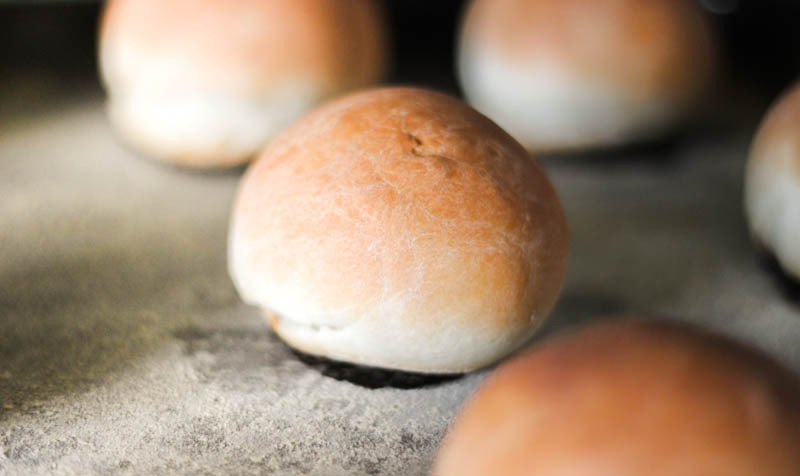 Hahah… Anyhow… the oven buns turned out great!! Really fluffy and tasty. The recipe is easy to follow. If you don’t believe me then try it for yourself. And enjoy!! Sooo… my message for all those who don’t feel that they have the skills or have being failing in baking, is that don’t give up! Keep up and one day you will succeed. 1. In a small bowl, dissolve yeast in milk and add the sugar. In a separate bowl, sift the flour with the salt and mix with molten butter. 2. Combine the yeast with the flour. 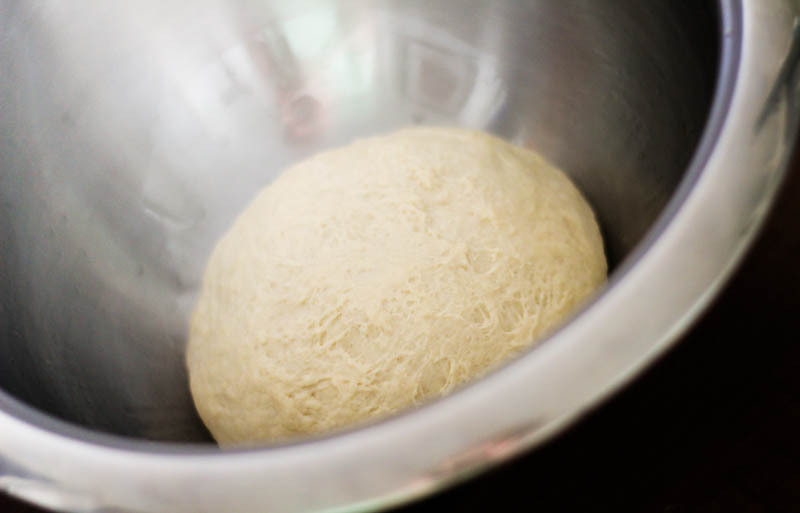 Put this dough on a floured surface and knead the dough until smooth and elastic. 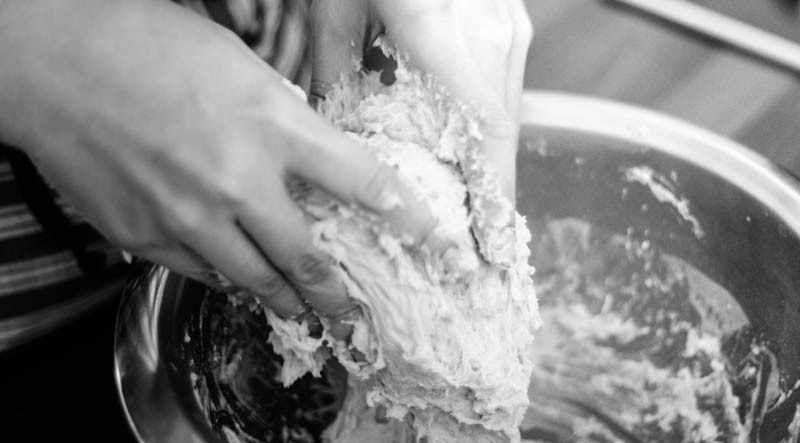 Transfer the dough to an oiled bowl. Cover with a clean dish towel and let it rise in a warm dry place for 45 minutes. 3. 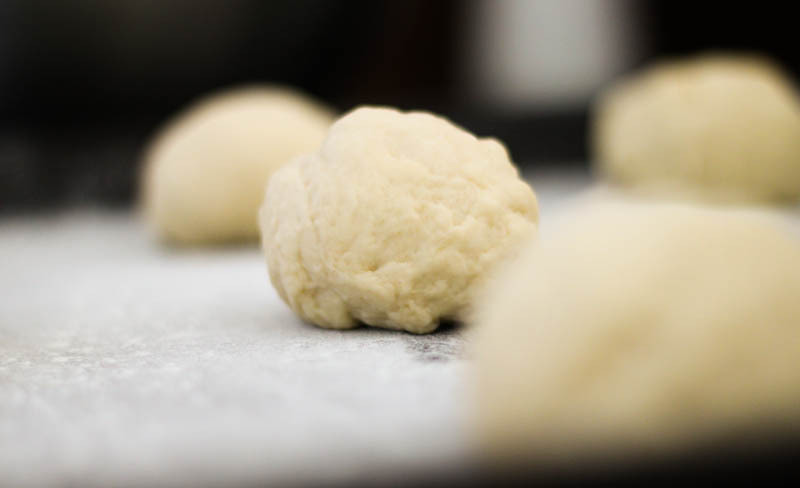 Put the dough on a floured surface and divide into just nine balls. Place balls of dough into a greased and floured baking tray that measures about 23 inches. Cover rolls and let them rise for another 15 minutes. Preheat oven to 220 ° C.
4. Bake the loaves for 15 to 20 minutes or until colored and fluffy. Serve the bread still warm. P.S. 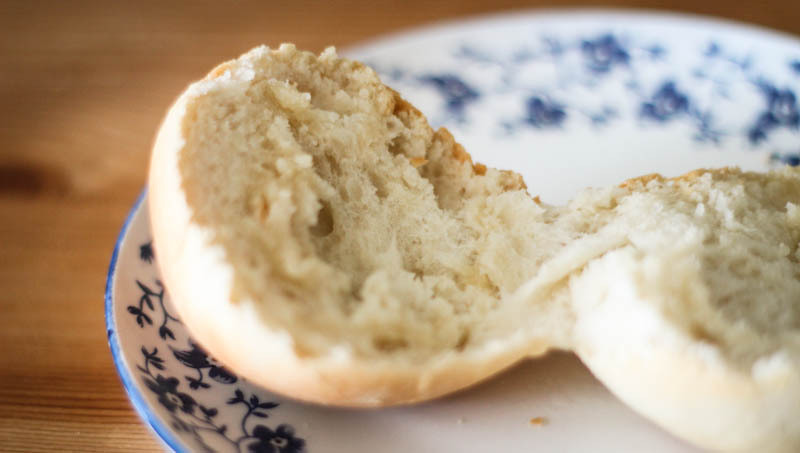 This kind of bread is not savory, normally you eat it with sweets or just butter. Therefore if you wish to have saltier buns feel free to add more salt.